LAKE BUENA VISTA, Fla. -- When you play the Magnolia golf course at Walt Disney World, there are only two ways to know you're on the property of the biggest tourist destination in America. The par-3 sixth hole on the Magnolia Course at Walt Disney World has the signature Mickey Mouse bunker in front of the green. There is the famous Mickey Mouse bunker on No. 6 (a large bunker with two smaller bunkers that are connected and resemble Mickey's head) and there's the whistle of the trains that surround the Magic Kingdom. They aren't that loud -- and shouldn't disturb your backswing -- but it's a reminder of where you are. Of Disney's 99 holes of golf -- five championship courses and another 9-hole course -- the Magnolia, at 7,190 yards, is the longest. 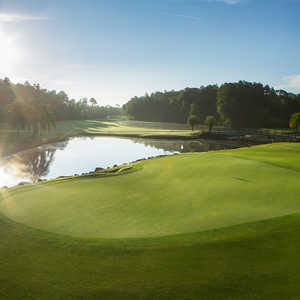 The Magnolia Course hosts the Children's Miracle Network Hospitals Classic at the end of October, which caps the official PGA Tour season. It's one of the most interesting and important events on tour. Only the top 125 money leaders get their tour card at the end of the season. While most of the top tour players stay away from the Disney event, those on the border of the top 125 are playing for their cards. It makes for an interesting back nine on Sunday, when every shot can mean either making the PGA Tour or heading to the Nationwide Tour, golf's minor leagues. The Joe Lee design isn't one of the harder ones on the PGA Tour. And the set-up is tourist-friendly until October, when Disney starts setting up for the tournament. 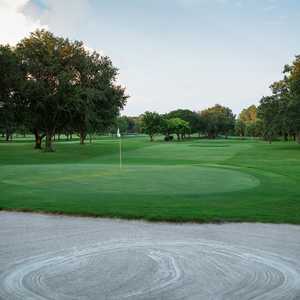 Magnolia is designed as a course for tourists simply looking for a fun round of golf. The length isn't too long and the fairways are normally straight. Disney's Magnolia Course isn't difficult at the start until you get to the par-4 fifth hole. At 432 yards, it requires a straight tee shot. You won't need the driver or you might run through the fairway. The approach shot is everything. That's typical of the Magnolia Course, where water prominently comes into play on 11 of the 18 holes. The back nine is shorter, but more difficult, and the water becomes more of factor, starting with the 526-yard, par-5 10th hole. The 13th, a short par 4, is the easiest hole on the course, but No. 14 is 592 yards with many bunkers that can make or break your round. The closing stretch is where many tour pros have seen their dreams shattered. Even if the Magnolia weren't on the Walt Disney World® Resort property, it would still be a great course. But the atmosphere at Disney is special -- you can't help but have fun. 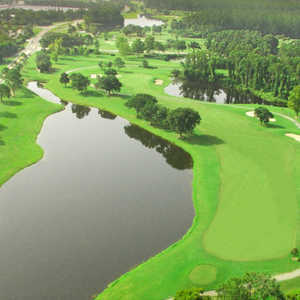 The golf is a great getaway from the parks, and there are few places that take better care of their guests that Disney. The course isn't too tough, but you better bring every club because you will need them all.